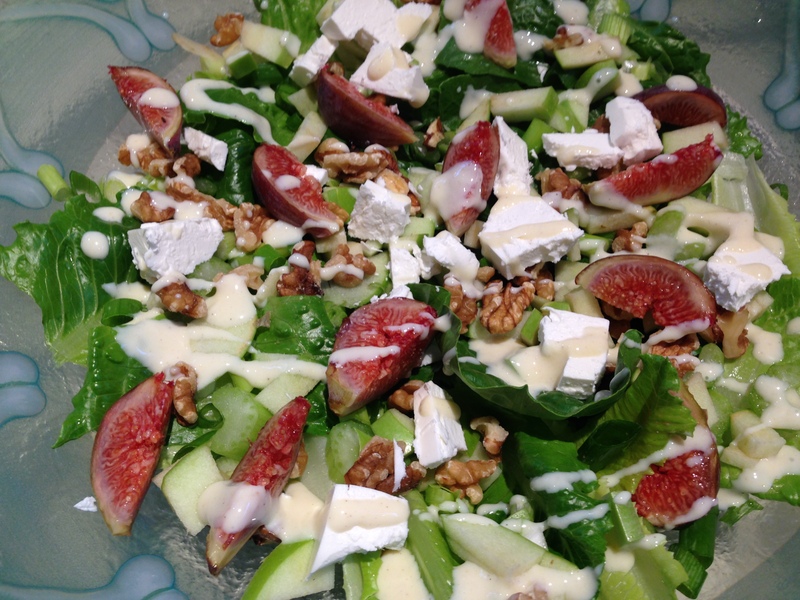 This is a super-scrummy salad that is easy to prepare and chock full of goodness. It’s satisfying enough that you could eat a bowl on its own, but it’s also a great side for roasts and barbeques. I use kale leaves as a base and then add whatever other raw vegetables are in the fridge to make up four cups. Needless to say it tastes a little different every time I make it! The dressing is also stupidly easy. This salad will feed your gut microbes, adding in friendlies from the miso paste, and using the acid in the orange juice to make everything more digestible. The umeboshi plum has a myriad health benefits, and your gut will love it! The salad will only keep for 24 hours once you add the dressing, so it is best made close to serving, and any leftovers eaten the next day. Want to make a higher protein meal in a bowl? Add some white beans, grilled or cold cooked chicken, pork or seafood. The dressing can also be used as a glaze (don’t make it quite as thin) for baking/grilling salmon. 2 cups of shredded kale leaves (not the rib!) and a selection of the following to make up another two cups of shredded vegetables: carrots, zucchini, beetroot, apple, red or green cabbage. 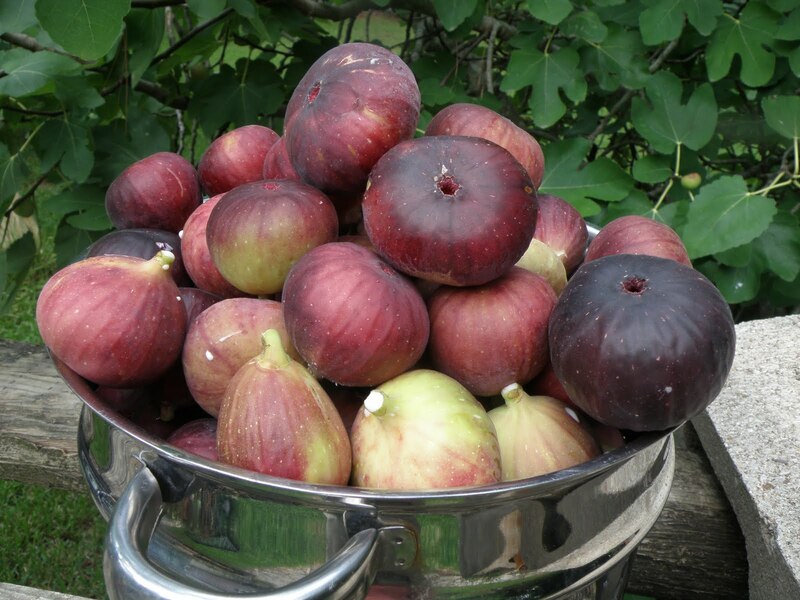 Plus one small red salad onion, an orange and a couple of tablespoons of your favourite seed and nut mix. I sometimes use a trail mix that also has dried cranberries and sultanas for some OMG yumness. For the dressing you’ll need two heaped teaspoons of white miso paste, juice of half an orange (give or take) and if you like, add a 1/4 teaspoon of umeboshi plum paste to give a salty tartness to the dressing (and for the awesome health benefits of this condiment). Shred or finely cut your kale, cabbage, carrots, and other vegetables of choice to make 4 cups. Add to a large bowl. I like the act of slicing and chopping. I use it like a mindfulness meditation, especially at the end of a long day of psychic work. It gives me decompression time. But if you are in a hurry or would rather decompress in front of Netflix using a mandolin or a food processor will have this job done in no time! Ridiculously time poor? Buy a bag of salad to add to your onion and orange combo. 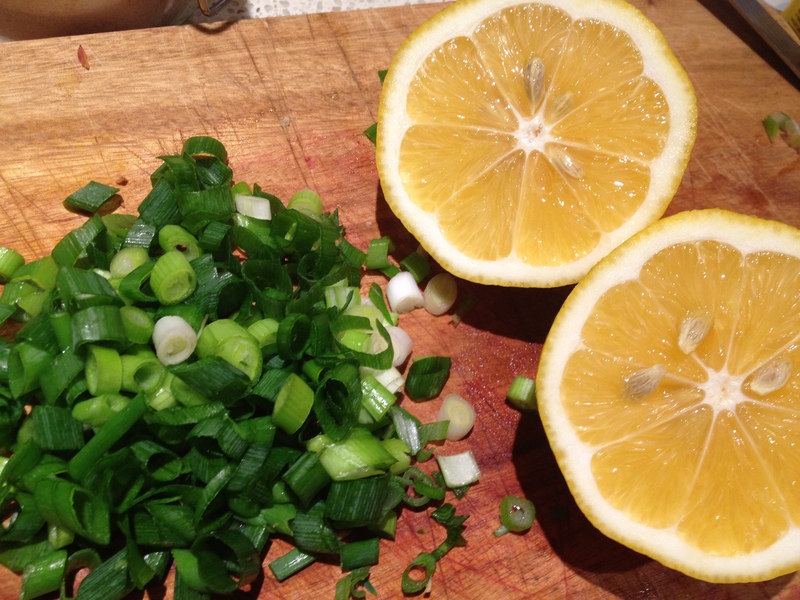 Finely dice the red onion, peel the orange and cut into small cubes, removing any seeds. Chuck the onion, orange and seed and nut mix into the bowl of vegetables. Dressing: Add the miso to a cup, and the umeboshi if you are using it. Umeboshi is strong flavoured, while white miso and orange are sweet and mild so be cautious about adding too much at first. Then add a small amount of orange juice and mix. Keep adding juice until it is thinned to a good consistency but still creamy. Taste and adjust juice or miso flavours if necessary. Pour over salad and mix well. It doesn’t take much juice to go from thick to creamy. This pic below is with a tablespoon of juice. A bit more of a stir and it would be great as a glaze. But for dressing we’ll need to add more juice. Pour over the dressing just before serving. Yum! This is such a simple salad, and it’s easy to throw together, but it tastes like a celebration! It might seem like a little work to segment the grapefruit, but it makes for a pretty result, and no chewy pith or seeds! Serve this salad on its own or as a tasty side with your next barbeque, fish fry or roast dinner. *If you’re cow’s milk intolerant, use a good sheep or goat fetta. *If you’re dairy-free, substitute some chunks of avocado. Place all ingredients in a jar and shake well. The mixture will become thick and creamy. USe what you need on your salad and store the rest in the fridge for up to one week. Layer the leaves in the bottom of a large serving bowl. Halve the onion and cut into thin slices. Separate the rings with your fingers. Slice the ends of the grapefruit and then remove the rest of the peel. Using a sharp knife, cut between each membrane to remove the segments of flesh. Set aside. Cut the fetta into bite-size pieces. Add a dash of olive oil to your frypan. Snap or trim the ends off the bottom of the asparagus spears. 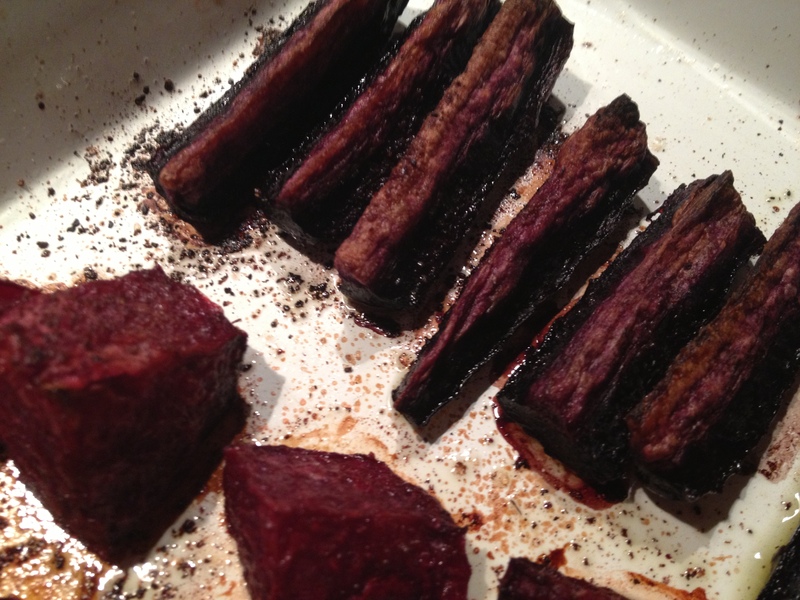 Toss over a medium flame for two to three minutes or until cooked but still crunchy. *Warning: Be careful not to eat too much asparagus before it gets to the salad dish! Lay the asparagus, grapefruit, onion, fetta and cashews over the top of the leaves. Drizzle with dressing. Toss and serve. This is a tasty and nutritious salad that is also very visually appealing. You could enjoy it on its own, but I chose to serve mine as an accompaniment to roast lamb. I’m quite in love with kale. You can read more about the many health benefits of this awesome leafy green here. If you don’t have access to kale use spinach leaves or rocket (arugula). 3 cups of kale (leaf only – rib removed), seeds from one large pomegranate, 1/2 cup macadamia nut pieces, 1/2 cup of fetta cheese, 2 cups of sweet potato (any variety!) and a little olive oil or coconut oil for roasting. Oil of your choice to dress salad – I used a lemon-myrtle infused macadamia oil. Note: For a vegan version substitute the fetta for a vegan cheese or use avocado. Preheat oven to moderate (180 degree oven – 350 degrees fahrenheit) and prepare a large tray by lining it with baking paper (Prevents sticking and saves on washing up later.) If you’re already cooking a roast or some other dish in the oven all the better! Wash and dry the sweet potato and then cut into small chunks. Coat lightly with oil (I chuck all the pieces in a bowl, pour in a slug of oil and massage with my fingers to get the job done) and then place the pieces on your baking-paper lined tray. Place into the oven and cook until golden – about 40 minutes, depending on size of pieces. De-seed the pomegranate, and wash the arils (seeds) to remove any pith. Drain well and set aside. Wash and dry the kale leaves and then shred finely with a sharp knife. Cut or crumble the fetta cheese. Toast the macadamia nuts over moderate heat in a dry frypan. Push them around with a spoon so that they cook evenly and don’t burn on one side. Watch them while you do this. (Note that some of mine got a bit toasty due to talking too much to Dana and not paying attention to my nuts!). It only takes a few minutes but it’s worth doing as it gives a beautiful complexity of flavour. Place the shredded kale in a bowl and dump the hot roasted sweet potato on top. Tip in the nuts and fetta cheese. Now add the pomegranate arils. Toss together with a slug of your favourite oil. Lamb – roasted, pan fried, or barbequed – 3/4 cup per person or to suit your personal taste. Two cups of kale, two cups of cherry tomatoes 1/2 cup of shredded carrot, 1/2 cup each of shredded red and white cabbage, 3 tablespoons of pine nuts, 1/4 cup of fresh basil leaves. Note – if you LOVE salad feel free to throw in some more kale, cabbage or carrot. 2 tablespoons of tahini,1 teaspoon minced garlic, 2 tablespoons of lemon juice, salt and pepper to taste, 2 to 3 tablespoons of water. Preheat oven to moderate (170 degree celcius fan-forced or 180 degree oven – 350 degrees fahrenheit). Organise your lamb so that it will be cooked the way you like it. If you’re cooking for one go for a few small pieces of lamb rump or fillet. Pan fry to your liking and then rest for ten minutes. If you’re feeding a crowd roast or barbeque a butterflied lamb leg. You could also cook a traditional lamb leg with the bone in, but your cooking time will be much longer. If you are roasting the lamb make sure there’s room on another shelf for your tomatoes! No matter how you cook your lamb, set the cooked meat aside for at least ten minutes before slicing so the meat can rest and the juices can reabsorb into the meat, giving it extra flavour and tenderness. Wash your tomatoes and then cut them in half. Place halves on a baking-paper lined tray and roast for thirty minutes. They will have shrunk in size, and be a little caramelised on the edges or underneath. Yum! Shred your carrot and cabbage. Strip the kale from the tough middle rib and slice it very finely. Mix the cabbage, carrot and kale together in the bottom of your serving dish. 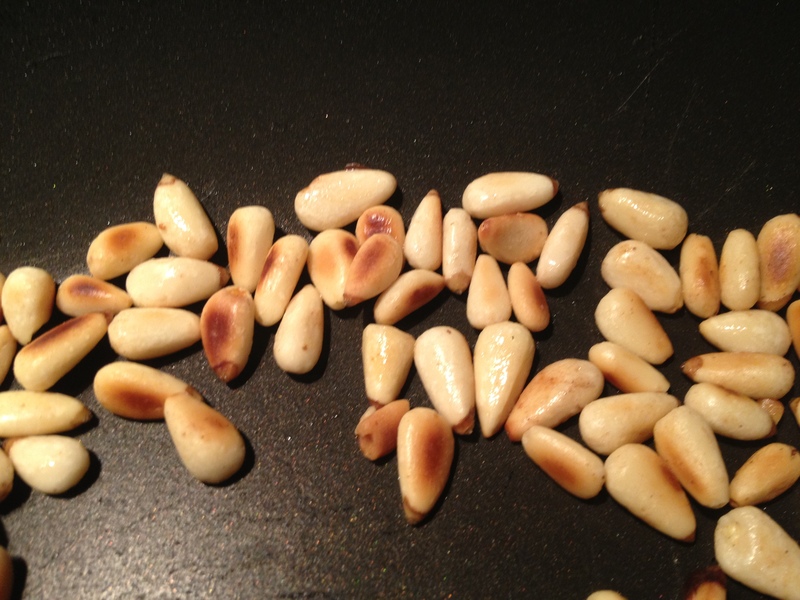 Toast the pine nuts in a dry frypan over medium heat. This will take a few minutes. Keep moving them around so they don’t burn. Remove from heat and allow to cool. Shred the basil leaves finely. To make the dressing add tahini, garlic and lemon juice to a small bowl and stir well. Then add the water a little at a time until the dressing is smooth, creamy and can be poured. To assemble the salad place the roasted tomatoes on top of the raw greens. Slice the lamb and add to the salad. Drizzle the tahini dressing over the top, scatter the toasted pine nuts and then place the shredded basil in the centre of the dish. It was a positively delicious dinner, so I was delighted there were left-overs for today’s lunch! 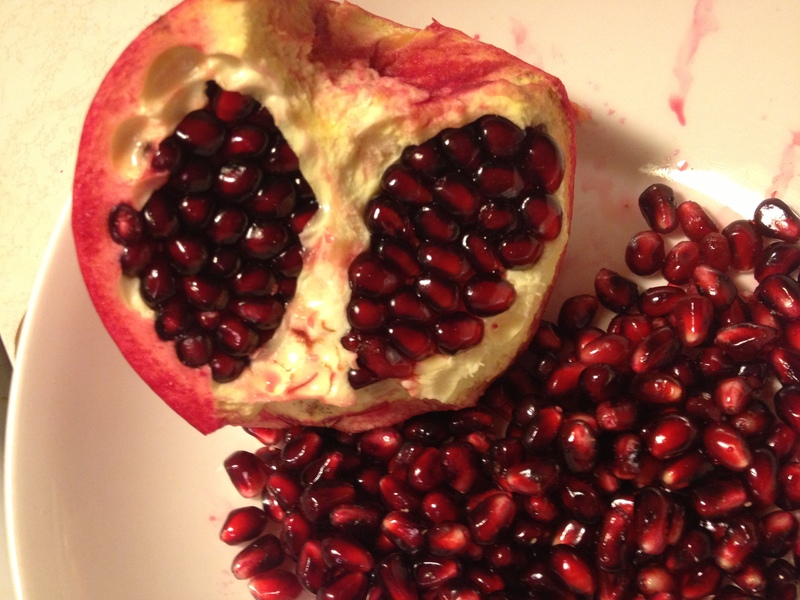 Fun fact #1 about pomegranates: Pomegranates are awesome. Fun fact #3: A lot of people think you’re not supposed to eat the seeds of a pomegranate – but that’s not true, people who tell you that are liars, and they don’t know anything about life, and they should never be trusted. Isn’t this salad just the prettiest thing? Pomegranates, those tart and sweet little delights, are food as medicine, especially for those suffering from Lyme disease or other antibiotic-resistant bacterial infections. There is a substance in pomegranates which busts the biofilm of these bacteria, enabling drugs and herbs to effectively target the naked pathogen and eradicate it! 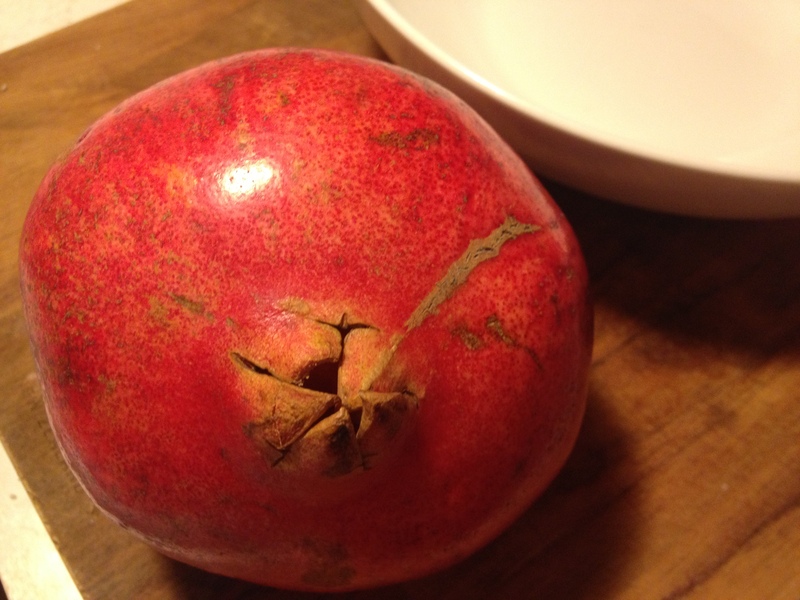 Other reasons to eat pomegranates? They taste zesty and delicious; they’re packed with Vitamin C, anti-oxidants, magnesium, calcium, zinc, iron, manganese and B-group vitamins, and they’re high in fibre. Pomegranates support healthy blood sugar, aid wound healing and reduce inflammation. 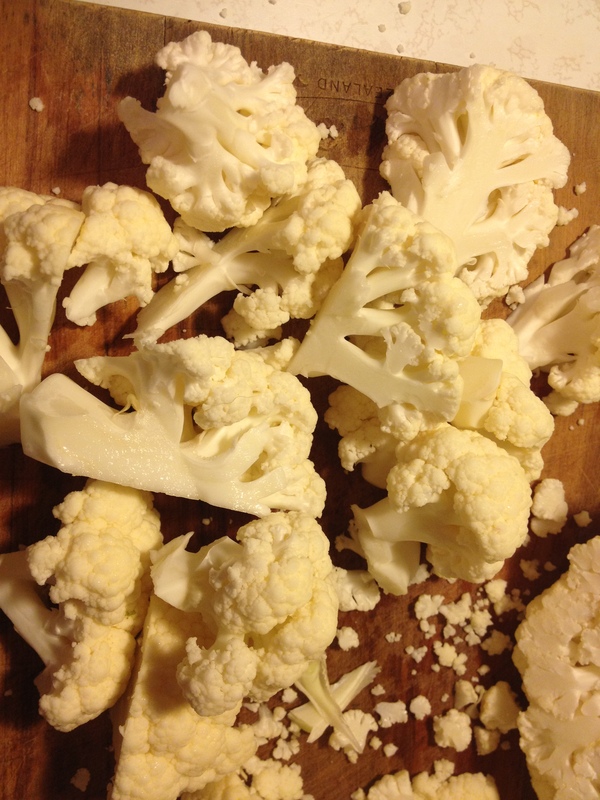 Cauliflower, a cruciferous vegetable, boosts Phase 1 detox of your liver pathways, as well as being an anti-inflammatory and cancer-retardant. This speedy salad is easy to make and super-good for you, as well as being fresh and delicious. Eat it on its own, or as a side dish for fish, chicken or barbequed meats. 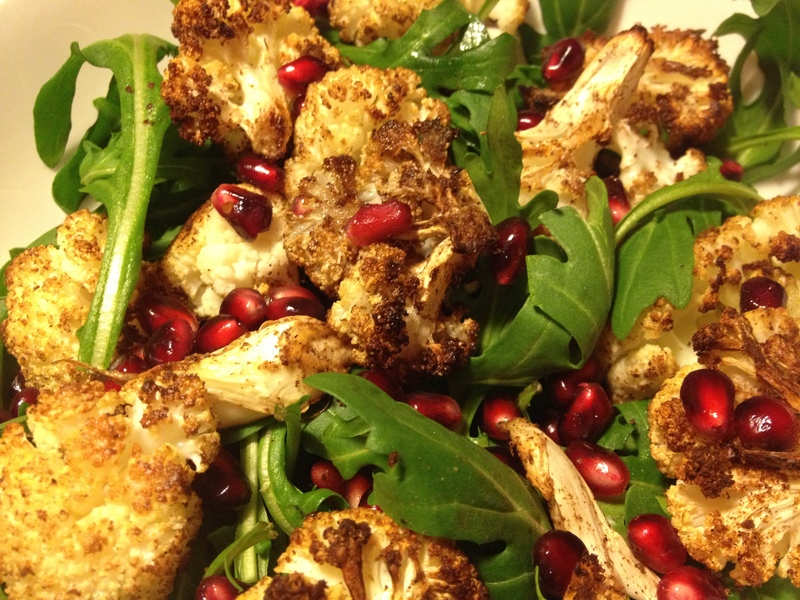 1 pomegranate, 1 head of cauliflower, 2 cups of rocket (arugula) or other bitter greens, 1 heaped teaspoon of ground cumin, 1 heaped teaspoon of garam masala (or just use more cumin), 2 to 3 tablespoons of coconut oil (or ghee if you prefer), cold pressed olive oil and fresh lemon juice to serve. Preheat your oven to 200 degrees celcius (400 degrees fahrenheit) if fan forced, or 220 degrees celcius (440 degrees fahrenheit) if not. Split open the pomegranate with a sharp knife and then use your thumbs to break open the segments and release the tiny jewels (seeds) inside. Clear off most of the white pith. Set pomegranate seeds aside until later. 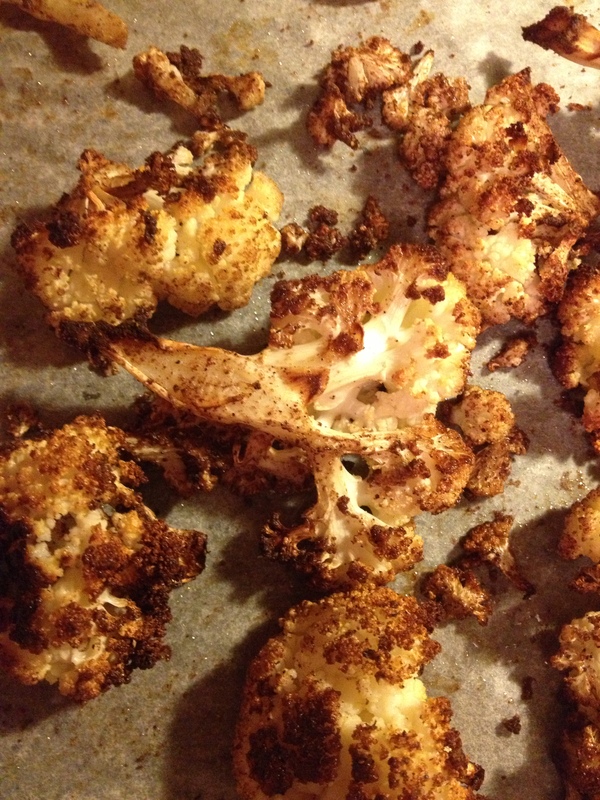 Place cauliflower on a baking-paper lined tray for easy clean up. Pop into oven for fifteen minutes or until golden. Combine with the pomegranate and rocket leaves. Drizzle with olive oil and a squeeze of fresh lemon juice. Eat with gusto. 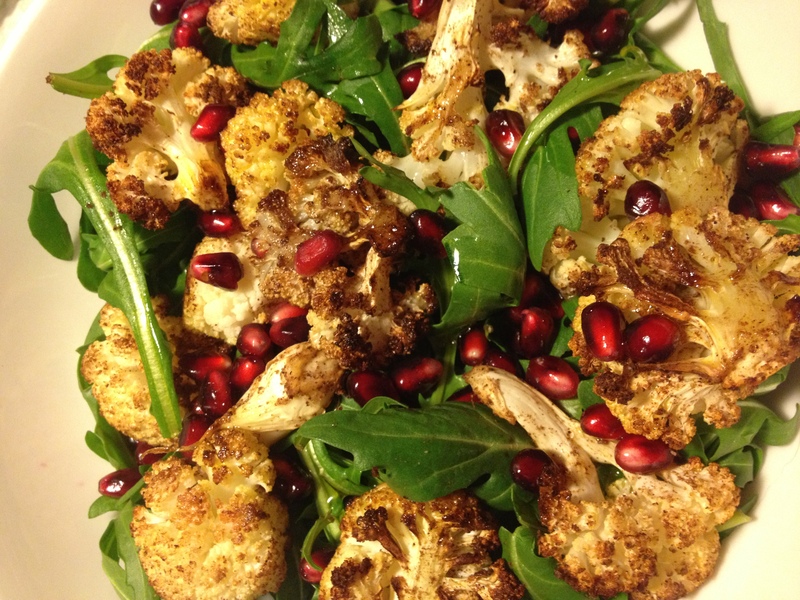 PS: If you want to serve this as a cold salad let the cauliflower cool completely before combing with the rocket and pomegranate so that the rocket doesn’t get all sad and wilted. PSS: OMG, I have missed cooking!!! 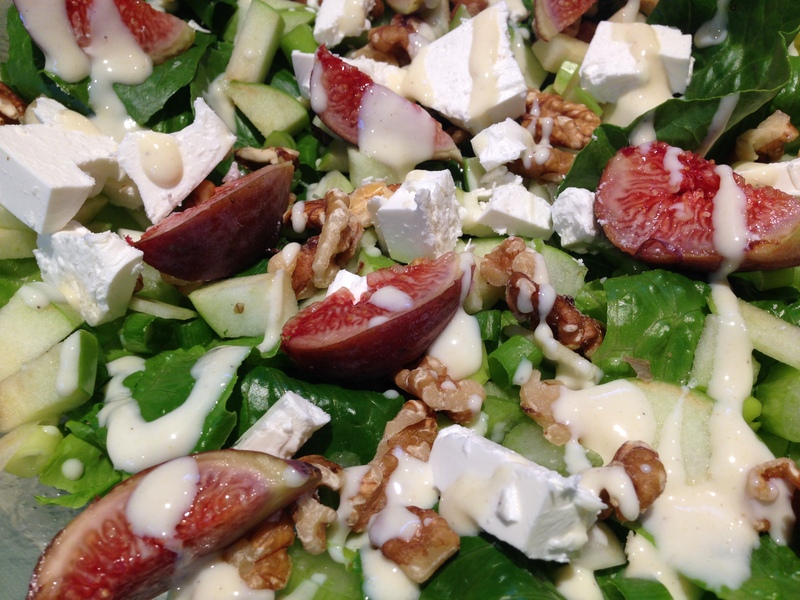 I love salads any time of year – as a main event, or as a side for anything from soup to roasts. I made this one to go with a roast lamb dinner. The crunchy beans paired with the salt of the cheese, the sweetness of the tomatoes, capsicum and onions, and the zesty citrus dressing are a delectable combination! We ate this salad again yesterday for lunch, with some of the cold meat tossed through it. Did I mention I am a huge fan of left-overs? 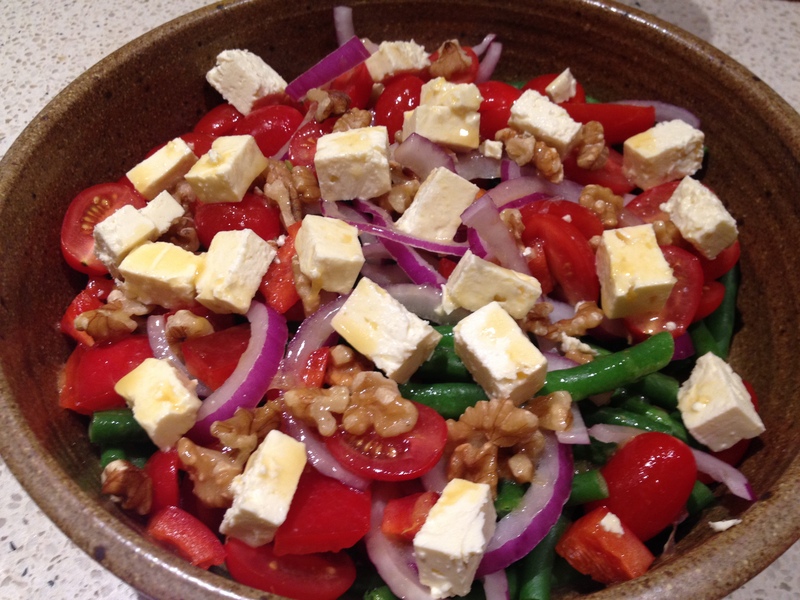 Four big handfuls of fresh green beans, one cup of halved cherry or baby roma tomatoes, one small red capsicum (bell pepper) seeded and chopped, one red salad onion halved and cut into thin slices – separate out, one small block of *fetta cheese – cubed, half to one cup of walnut pieces. These ingredients came easily be halved or doubled, depending on the size of your crowd. Don’t be afraid to make too much of this salad. It’s delicious and keeps well for lunches or as a side for another meal. *Vegans – use your favourite cheese substitute or replace with tofu! Wash, top and tail beans. 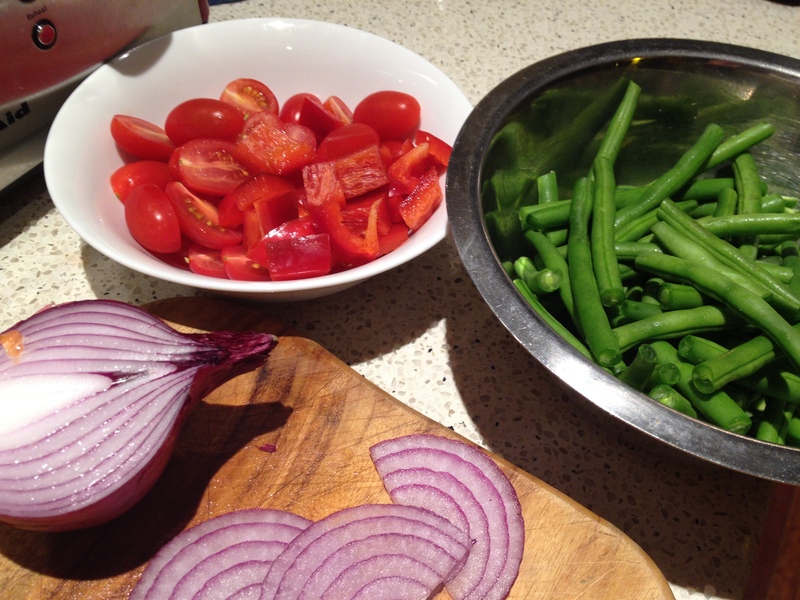 Slice up onions, capsicum and tomatoes. Cube your cheese. Bring a saucepan of water to the boil and drop in the beans. Cook for two to three minutes, so that they are blanched but not completely cooked. Hint – test one by carefully removing from water with tongs or a fork. When you bite down the bean will have softened slightly but still be crunchy. 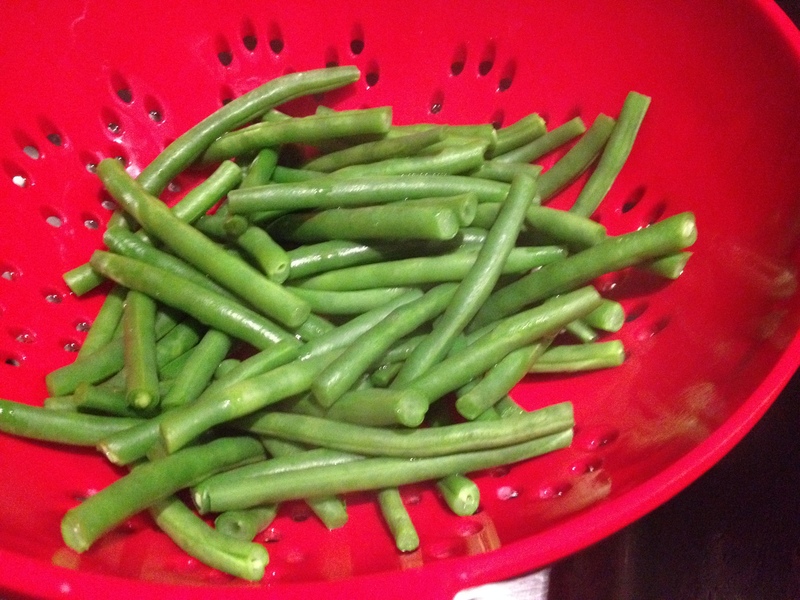 Drain beans and run some cold water over them to halt the cooking process. Drain well. Place beans into a serving bowl and later other ingredients over the top. Pour dressing over finished salad and let it sit for five minutes to absorb flavours. Juice of half an orange, 1 crushed garlic clove, 1 teaspoon grated fresh ginger root, 1 heaped teaspoon of your favourite miso paste, 1 tablespoon of sesame oil, tiny pinch of salt. Shake all ingredients together in a lidded jar until well combined. Pour over salad. This salad makes a good light meal, but is also the perfect accompaniment to roasts, barbeques and bakes. Will store well, refrigerated for three to four days. 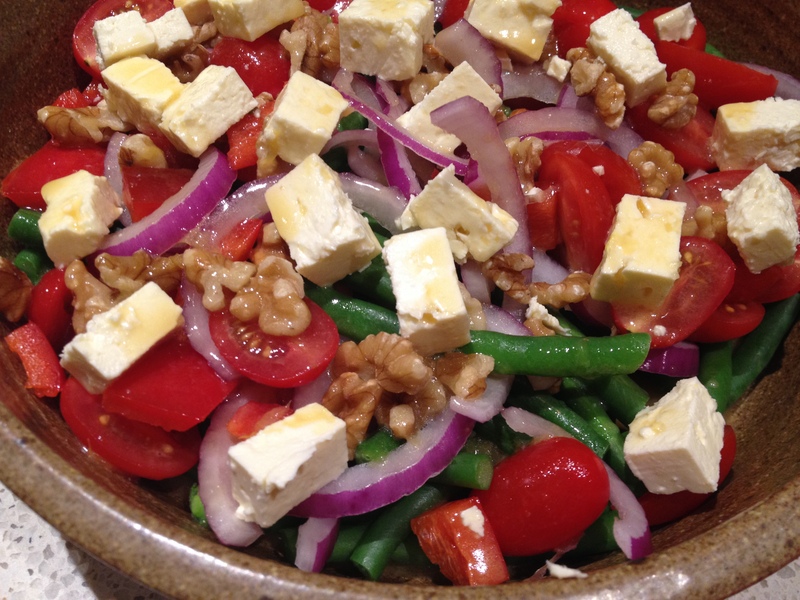 I love my salads, but winter is a time better suited to warm foods and slow foods. The solution? A warm salad! This salad combines the sweetness of baked pears (OMG – seriously there is not much nommier than a baked pear!) 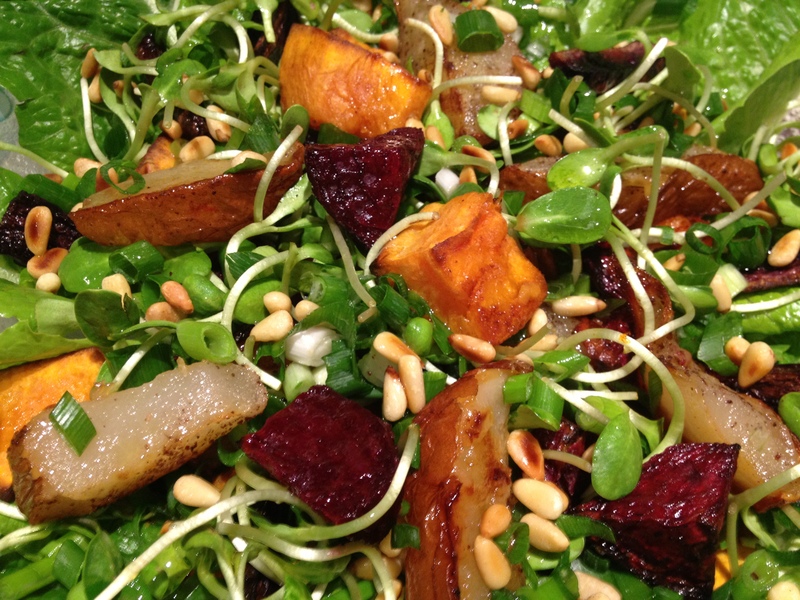 and root vegetables, with the tart crispness of cos lettuce and creamy sunflower sprouts to round things out. As a meal in itself add a little of your favourite cheese (blue is fabulous), or serve it as a tasty side for dinner. It also works well as a cold salad for any left-overs. According to Traditional Chinese Medicine slow cooked or roasted root vegetables and pears are very nourishing for our adrenals and thyroids, and help us to rest well and to heal. They fill up our depleted batteries. The salt (but it must be a good salt, like a Celtic or pink Tibetan salt) nurtures our kidneys and supports us through winter. Sunflower sprouts are chock-full of anti-oxidants, nutrients, beneficial enzymes, oxygen and are very alkalanising for your body. Even if it’s not winter in your part of the world this salad will help beat fatigue, and support your body and spirit if you are run ragged. Plus it’s yum! 1 small cos lettuce, 1 handful of sunflower seed sprouts (if you can’t find these substitute your favourite sprouts), 1 large beetroot, 2 carrots (I used purple because purple is awesome!) 2 firm beurre bosc pears, 1 to 2 heaped cups of sweet potato cubes, 2 tablespoons of pine nuts, 2 large green onions/shallots chopped, ghee or coconut oil for roasting, virgin cold pressed olive oil for your dressing, 1/2 a fresh lemon, good quality salt, ground ginger, sumac. Toast your pine nuts by dry frying in a frypan over medium heat, tossing regularly until they are browned. 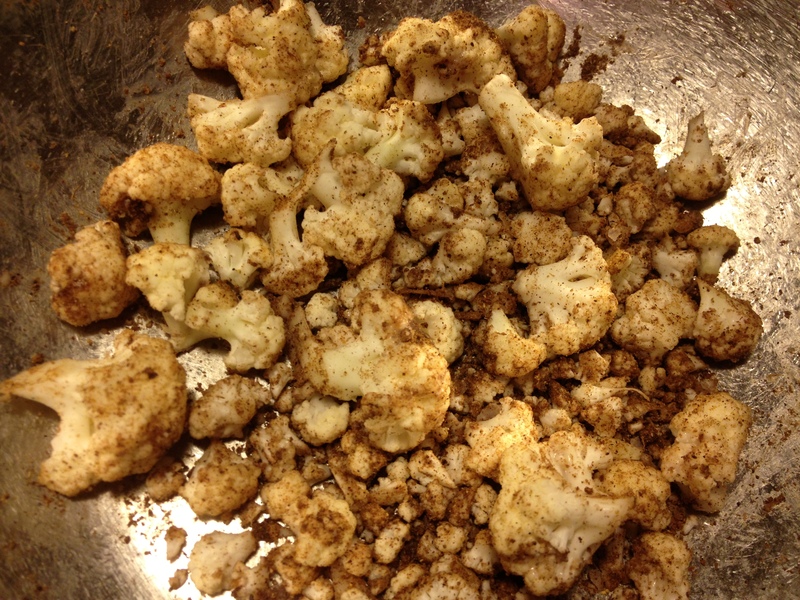 Remove from heat and put into a bowl to stop them cooking any further. 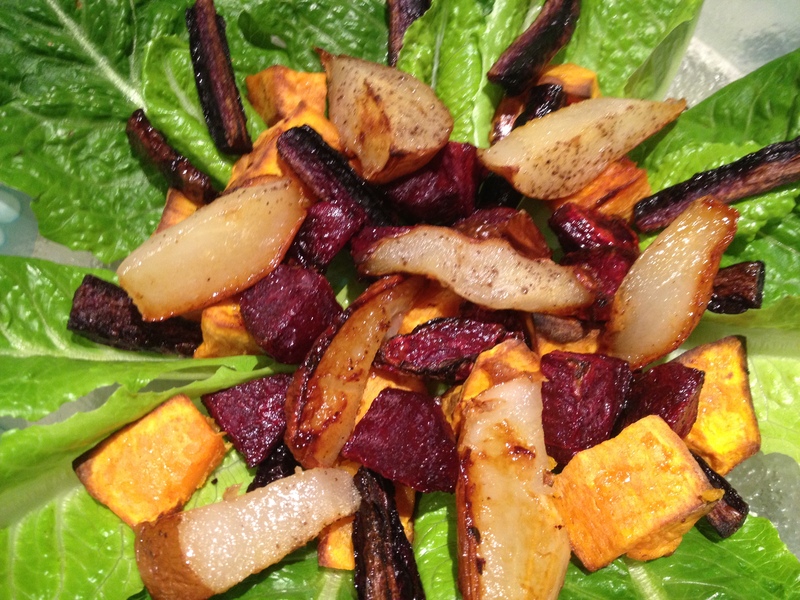 Peel and cut the beetroot and sweet potato into cubes. Slice the pears and remove the core (no need to peel) and cut the carrots into batons. Toss with some ghee or coconut oil and arrange on a baking tray. Sprinkle with salt. Put ground ginger on your sweet potato and pears. 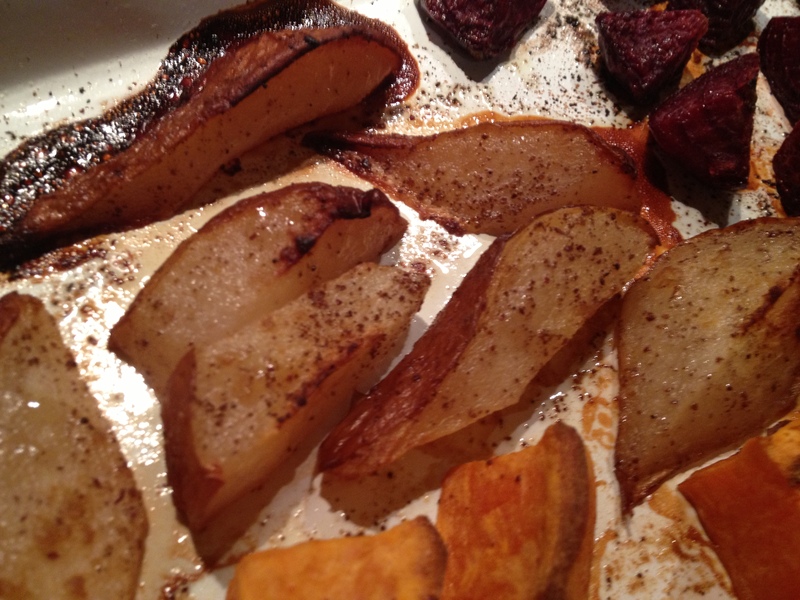 Add sumac to the pears, carrots and beetroot. Bake in a hot oven (180 degrees celsius or 350 degrees fahrenheit) for 30 minutes or until browned and cooked through. Wash lettuce leaves and arrange on outside of bowl. When vegetables and pears are baked add into the centre of the leaves. 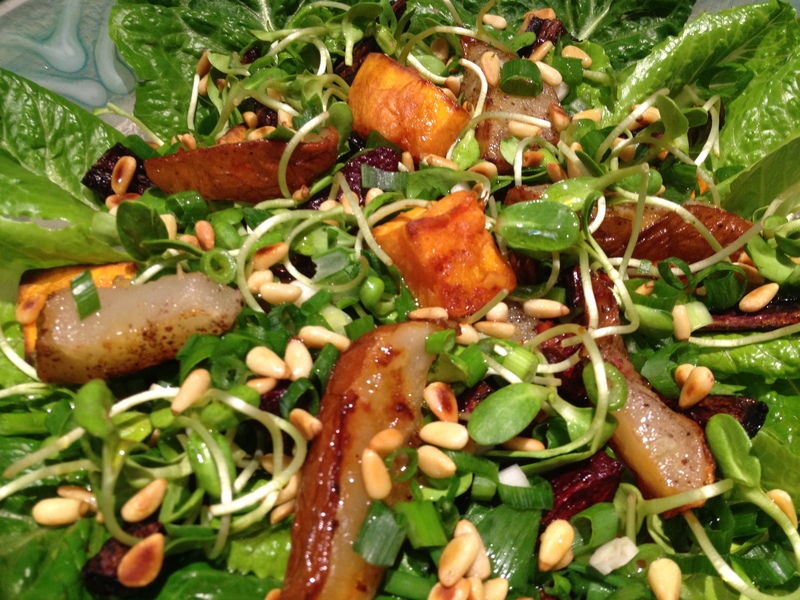 Place your sunflower shoots and green onions/shallots on top, and add in your pine nuts. Drizzle with olive oil and squeeze some fresh lemon over the top. Enjoy!